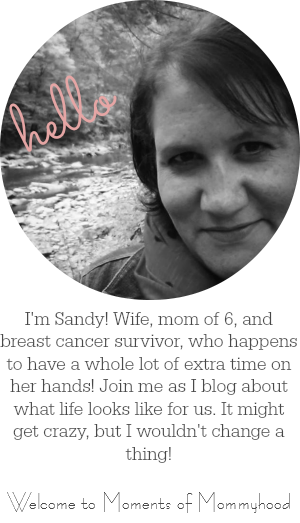 If you haven't visited Momdot and joined in on the blog party, well....what are you waiting for? It's not to late to start! Go here to check it out. Today's question is: What are some of your favorite family traditions? What are some that you want to begin? One of my family traditions is finding the Christmas pickle on the tree. You can learn more about this legend here. 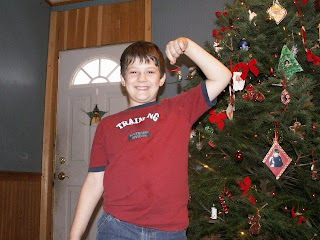 Here is a picture of Aaron after finding the pickle a few years ago. Family gatherings are always so important to us too. We have a get together with my family usually a few days before Christmas and with my hubby's family on Christmas Eve. Christmas day, we always stay home so that we can just relax and enjoy the day together as a family. The sponsers for day two are La Plates and Let's Go Strolling and Natitys Design! LOL A pickle on the tree. That's definitely different but has a good reason behind it. Christmas Pickle on the tree. That's the greatest thing I've heard all day! Here's My Day 2! Cute tradition! I've heard of it but had forgotten! I had never heard of the pickle tradition until my first Christmas with the in-laws. Now we've added one to our tree too. You're the second person I've heard talking about hiding the pickle. I'll have to read up on that, cuz I'd never heard of it before! I'm pregnant and now craving pickles! Gotta say, playing "hide the pickle" sounds pretty dirty! I'm so glad there is someone else who does this. Apparently I should have described it better on my blog. LOL! I like your pickle tradition! Different and fun. Sandy-bug! I love the Christmas Cookie Bake! What recipe do you want? I collect cookbooks and stalk recipe sites. You say it; I'll find it! Heehee...Christmas on the tree? That sounds fun! Granted, it would probably mold before we found it. Yes, we're that bad.